Walter Reed Bimson 1933 to 1953 (b. 1892 - d. 1980). (b. 1900). He was the brother of Walter Bimson. He was the son of Walter Bimson. (b. 5/17/1920 d. 4/11/2011). Known as both "Gil" and "Brad," he worked for Valley National Bank for more than 45 years, retiring as Chief Executive Officer and Chairman of the Board in October, 1982, and serving as a board member for another three years. Born on May 17, 1920, in Miami, Arizona, he started work for the Valley Bank in 1937 as a bookkeeper in the Miami Branch. On June 21, 1941, he married Marion Zelda Bebb at St. John's Episcopal Church in Globe, Arizona. During World War II, he served in the Army Air Corps and became a pilot. On February 25, 1944, Brad and his crew flying a mission in the Sophisticated Lady were shot down over Yugoslavia, in the territory of Marshall Tito's Partisans. The Partisans guided them to a rescue air strip, traveling over mountain tops, through dense forests and around German camps. On April 3rd, they were evacuated. Brad and his crew were awarded the Distinguished Flying Cross for this mission. Their story appeared as a comic strip in The American Air Forces magazine, misidentifying their plane as the Pistol Packin' Mama, the plane they had regularly flown until it was shot down manned by another crew. Years later, Brad and Marion wrote up the story for The Journal of Arizona History, Winter, 1995. On leaving the service in 1945, Brad returned to the Valley Bank in Globe as Assistant Bank Manager. From there he, in his own words, worked "through all phases of banking." He was based in Tucson for sixteen years, first as the manager of the downtown branch and then executive vice-president of the Southern Region. Tucson honored him as Man of the Year in 1963. He left Tucson for Phoenix in 1973 to become President of the Valley National Bank. In 1978 he was appointed to the Federal Advisory Council of the Federal Reserve System, and in 1979 he was named one of the top three chief executive officers in American banking by Financial World magazine. He retired fully in 1985. From his obituary. 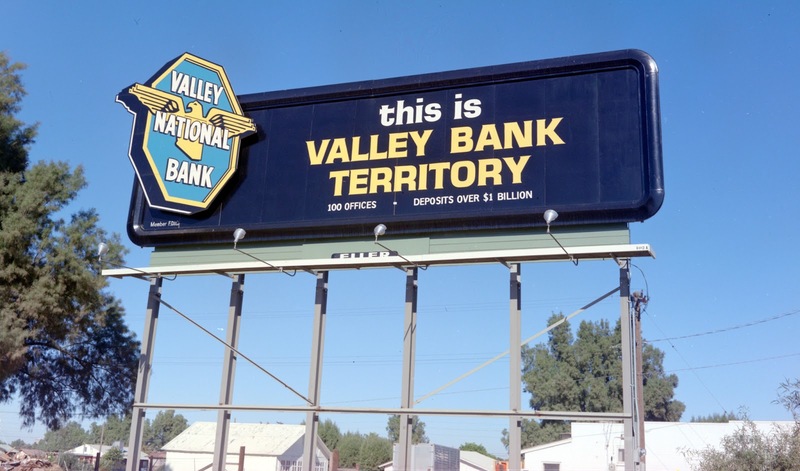 Valley National Bank became Bank One in 1992, which is now Chase Bank. As of this writing, Jamie Dimon is the current chairman, president and chief executive officer of JPMorgan Chase & Co.